Discussion in 'Fan Art' started by Handyman, Feb 7, 2019. 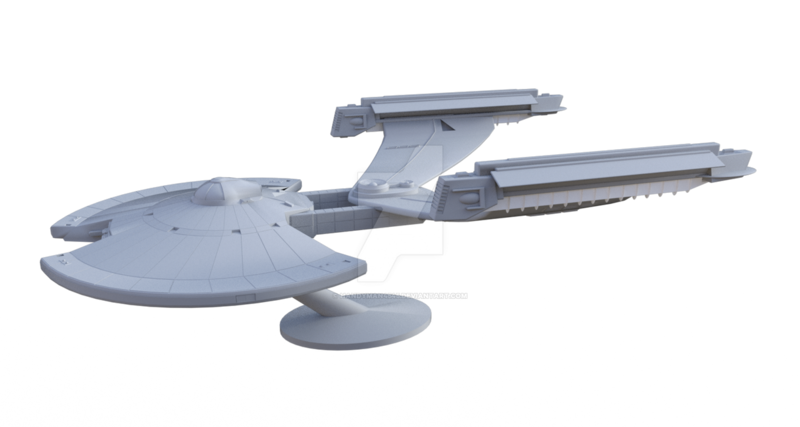 I have created several, non canon ships (see my PAG posts) via 3D software and I am now considering making actual models of them. Does anyone have any experience with this, suggestions on reputable printers and manufacturers and the potential pitfalls associated with it? What @AdmiralBuck is doing is very cool. 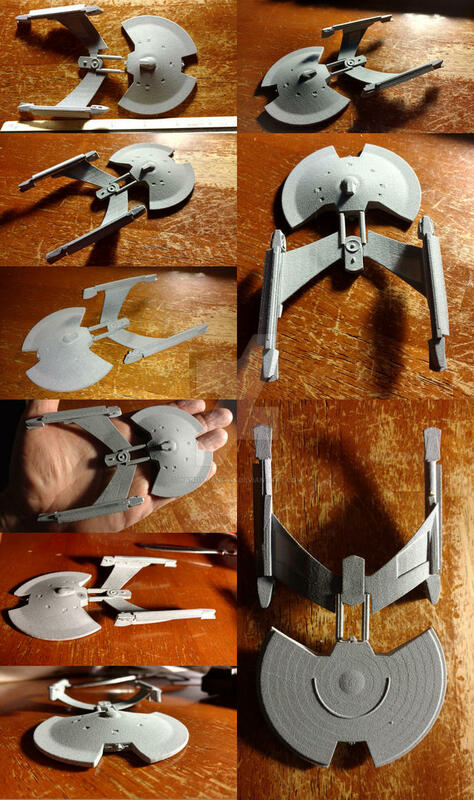 Don't know if he is still doing it (a lot of peeps have pulled back from publicly sharing their fan stuff) but if you are talking about 3D printing, @MadMan1701A might be the person to talk to. He's cranked out some awesome models in the last few years. Shapeways has various high detail plastics. All you'd have to do is ensure that your models were manifold(watertight). I settled on "JawsTec" for the moment. I did a search online for printers and of the small number that came up in Google, they were one. Being that I have no idea who they are or if they will honor my design autonomy, I took another design by another author that I downloaded from the internet and after modifying it some to create connecting devices on the 4 parts, sent it up for pricing and afterwards, ordered one unit last Monday. The shipping on the unit was noted at 3 to 5 business days and as of today (mail yet to come) it has not arrived and I have received no word of progress. The cost worked out to slightly less than $30 for a miniature starship approximately 130mm (5") long by 100mm (4") wide made from grey colored nylon. I am awaiting the delivery hopefully today, and will comment further as the project progresses. I'm actually impressed with the size and relative detail for a model that was so quickly thrown together. You can see a hint of the panels and rings in the saucer and the impulse crystal housing came out well too. The finish is a rough texture rather than a smooth gloss but I think that works better for the finished texture anyway. I had to work down the parts connectors a bit with sandpaper as I made the tolerances a bit to tight for the size but the tiny, and I mean TINY connector parts held up to the abuse of the sanding and fitting astoundingly well. 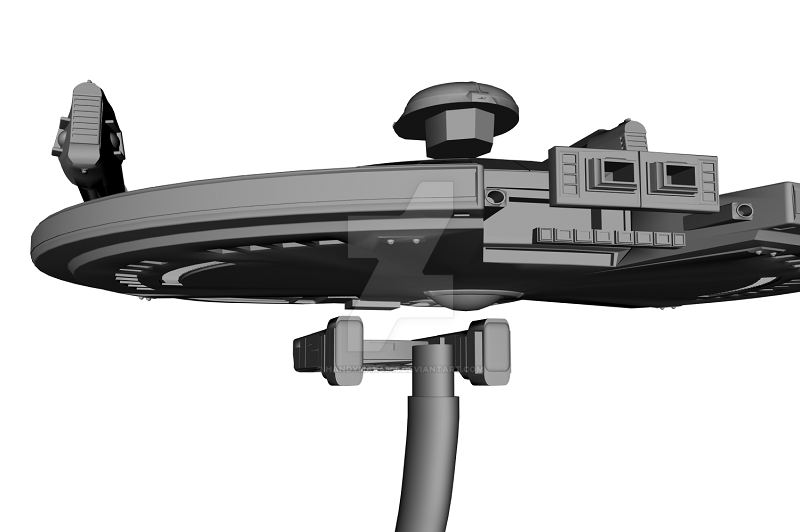 I will adjust the tolerances on the next model to make an easier fitting and also include a stand for it. The warp drive nauceals came to me with one detached from the warp nacelle pylon and the other barely hanging on. A little "Lock Tite" though and they're holding well. 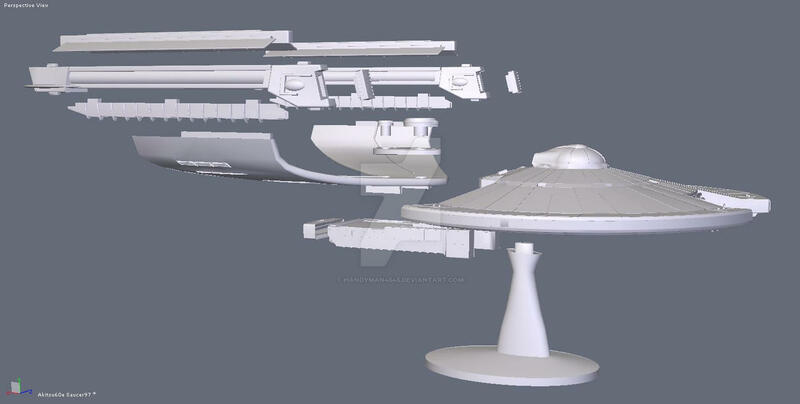 I'm now excited to see one of my ships from print. tax1234, Scribble and Matthew Raymond like this. Wow, this does look really good! And 26 bucks definitely seems like a very fair price. Ya... It turned out pretty cool for a boring, simple design. I'm working now on modifying my Akyazi now to run through the printing process next. I need to do it in parts so I build the individual connectors into the individual parts. Mine has a great deal more detail and is better scaled so it should turn out a little more impressive than the first one. I've spent like 6 hours working on making this model into snap together parts. One of the biggest challenges has been the single thickness surfaces that need to be doubled for production machining. My engineering pod has an exhaust port on the rear that's hollow. To draw that was a snap but to build in that hollow feature I had to cut the pod in two pieces, then repair the cuts and then start adding in "thickness's" to the drawings, single thickness walls and then create a method to attach them back together short of glueing them. As shown the rear nozzle slips into the rear of the engineering pod. The first frustration I've run into with Hex is that you can't simply "cut" a model and seperate the two sections without going through a lot of redundant vertices, points and polies. Hexagon isn't happy with the use of the "thickness" tool after you have holed or grouped the parts. You have to weld anything you've done that to in order to gain back use of a lot of the surface tools and that means no going back. That's a frustrating issue and major design flaw on the part of the techs but hey... It's free so I'm not gonna complain anymore. Then there was the snap together, peg and hole issue. Again, unless you have welded everything you can't use the "fast Extrude" or "Boolean" feature and that's a drag as well. Fortunately however, the verticy operation makes the model semi-transparent so you can see exactly where you need to make additional vertices for the pegs and holes in the parts from the inside of the model. 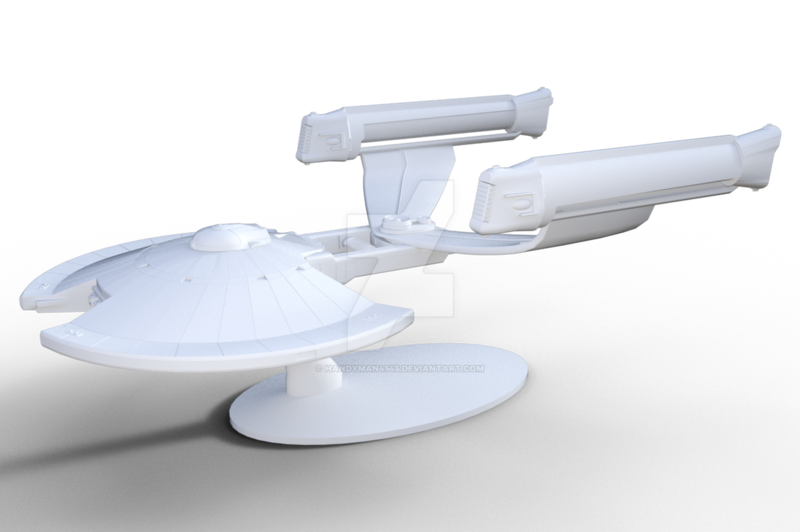 I'm now working on the warp drive pylons and embedding them into the top of the engineering pylons and the engineering pod. For that I have to work with the Boolean feature and then create some pegs. 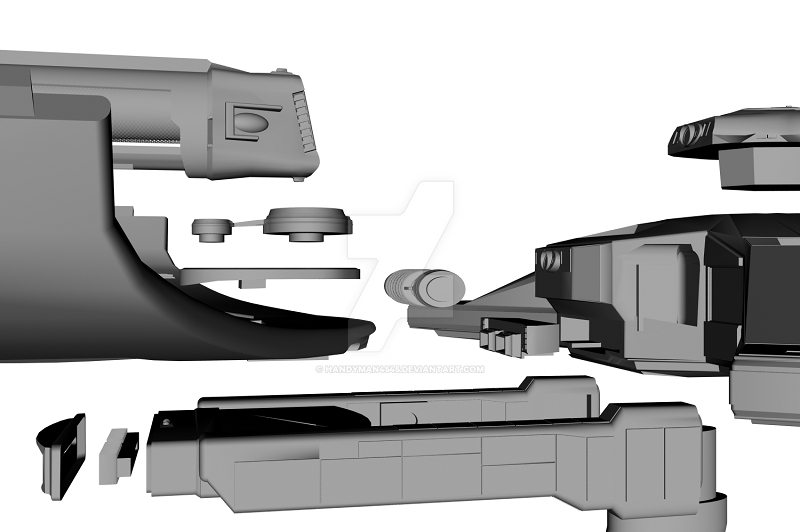 After that I'll put the impulse crystal housing together and then the warp drives and deflector shields. I finally finished piecing her up. She now has 14 pieces that either snap or slip together and will come in 6", 12" and 16" lengths. There are more shots of her on my Dev-Art site. I expect to have the first print in a week or so. I'll update the pics then. Atolm, Henoch and tax1234 like this. The Akitsu model is now shown on my website with additional pics. I'm still waiting for the first prototype to arrive and expect it by Monday next week. When the prototype arrives, I'll take additional pics of it and post them as well on the site. Psion, Atolm, tax1234 and 1 other person like this. Tomake something that actually fits together--now that's castable. Hey that is some brilliant work mate! The compliments make it all worth it. I reevaluated the theoretical ballance on the ship and redesigned the stand to sit further back. Probably ought to wait till the actual model arrives but it just seemed like something I needed to do. I'm now working on making the Arbiter in model form. Be pretty cool seeing both together. The Arbiter is now in model form. There are more pics of the model on my website but here are a couple, the first from Iray. The balance from 3Delight. The saucer was enlarged to accomodate an additional deck and an additional torpedo tube added to the rear. The forward RCS thrusters were moved slightly forward. A new bridge design was added and the engineering pylons were shortened slightly and softened up some and the shield generator system added. The warp drive engine pylons were dropped in height slightly, the impulse crystal housing shortened and the warp engines completely redesigned. The process took me maybe 6 hours I think. Less than the Akyazi anyway. Now I'm on to marketing the models and designing the Akula version. Nice. I've been toying with the idea of a 3D printer for miniatures for our tabletop games. The itch to buy one has returned. Love how you've broken these out to be almost snap together. I always preferred those to the stinky glue models. They are all a snap together fit. Some of the post and hole parts have their posts beveled slightly so that they expand slightly as they slide into the holes before snapping back into their original position. Others have a tapered post that starts into the hole narrow but tapers wider as it descends to lock in via friction. I'm anxiously awaiting the arrival of the first prototype Akyazi to see how well the theoretical design works on these smaller parts. I too have been toying with the concept of making miniatures for gaming though I don't game at all.